Hyderabad's very own Hussain Sagar Lake is surrounded by a number of tourist destinations and is always bustling with activities. It is also a place where you can go for a calming walk or better still, spend an entire evening. We'll tell you how. Begin your evening by visiting the Birla Mandir in Khairatabad, which is just 15 minutes from Hussain Sagar. This temple is built on a 280-feet high hill, making it visible from many areas of Hyderabad. Made out of white marble, this temple is nearly 50 years old but is still seen in travel brochures or videos pertaining to Hyderabad tourism. Do note that mobile phones or cameras aren’t allowed into the temple. A perfect place to spend an evening amidst nature, Lumbini Park is adjacent to the Hussain Sagar Lake and has many enjoyable activities like laser show, musical fountain, and boating. They have mechanised boating, speed boating and a ferry that takes you to see the magnificent Buddha statue up close. Don't worry for your safety as they give life jackets. So, just sit back and enjoy the ride. There is an inexplicable happiness in eating by the lake (if you leave the mosquitoes out of it). 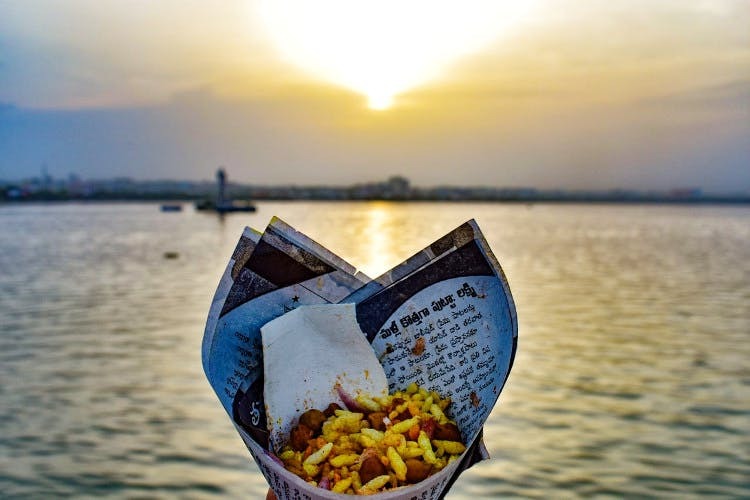 Eat Street is a favourite among city peeps and visitors who like to devour their food with a lake view. An array of stalls serving everything from chaat and pizza to Mughlai and North Indian cuisine makes it a foodie's paradise. You can choose to sit in the open air, or in the covered section and relish your food. There are a lot of toy rides for children here and it is also a popular choice to celebrate birthday parties. Walking alongside Necklace Road is, in itself, a breathtaking experience. Thanks to the eye-catching street art. Add a dash of colour to your Instagram feed with these aesthetics and be amused at the beauty of Hyderabad. There are a lot of stalls selling corn, palli, and bhel here so relish some street food, or simply burn calories. Head straight to Tank Bund for a captivating view of the sun set. The monolith Buddha statue, the changing colours of the sky and the sound of water have a calming effect on the viewers. Rest assured, you will forget all your worries and just be in the moment. When the sun goes down, it is party time. So, hit up By The Bay just above eat street for some drinks. This place is but a little bit of Goa in our own city. It screams coastal vibes from the surf boards, jerseys and lifebuoys hanging on walls, and feels much like a shack. So, get a table al fresco, a pint of beer, and end your evening with a bang.